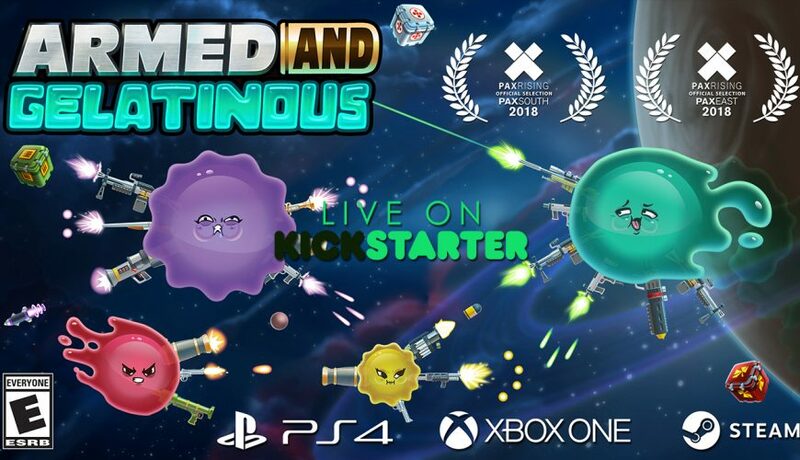 Los Angeles, March 20, 2018 – Three Flip Studios has announced a full-fledged campaign on popular crowdfunding platform Kickstarter to complete the final stages of development on the company’s 2nd title, Armed and Gelatinous. A fan favorite from PAX Aus and PAX South, the fast-paced bullet-hell space-shooter quickly reached 50% of its goal after the announcement the inclusion of an online-multiplayer component that is already up and running. Nearing completion after four years in development, the development studio has asked Kickstarter to provide them with one final push to help bring the game to market. With both the local and online multiplayer gameplay already completed, the main purpose for the crowdfunding campaign is to help polish up the game’s user interface and back-end systems such as cloud saving and online leaderboards. With Kickstarter’s backing, Three Flip Studios anticipates Armed and Gelatinous to be released with online multiplayer on Xbox One, PlayStation 4, and Steam before the end of 2018.